It's not that often that man leaves a impression on fans with his first title defense but that's exactly what Takashi Miura (26-2-2, 19) did when he traveled to Mexico and defended his WBC Super Featherweight title for the first time. Miura, who put on an absolutely enthralling brawl with Sergio "Yeyo" Thompson, may well have been involved in the true fight of the year. Despite how good Miura/Thompson was there is every chance that Miura may actually be involved in an even more exciting fight on New Years Eve as he fights Dante Jardon (24-3, 20). Like Thompson, Jardon is a big hitter with an offensive mindset and a real will to win and like the Thompson fight Jardon has the style to give us fireworks when he meets Miura. 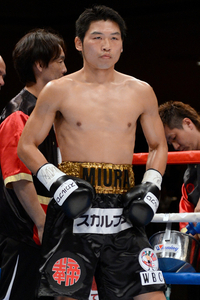 Miura first popped on to the international scene back in early 2011 as he challenged the fantastic Takashi Uchiyama for the WBA title. Although Miura came up short on that day, forced to retire due to severe swelling, he had dropped Uchiyama and given his domestic rival a genuinely tough nights work. Following the loss to Uchiyama few would have expected Miura to go on a 6 fight winning streak defeating both Gamaliel Diaz and Sergio Thompson in back to back fights to win and then defend the WBC title. That however is exactly what Miura has done and in the process he has scored numerous knockdowns and generated a genuine fan base of his own. Whilst the Japanese Southpaw can be dragged in to a war, as he was against Thompson, he can also box with real success. We wouldn't describe him as the best boxer in the division but his combination of strong boxing and very good brawling makes him nothing short of a pleasure to watch. In Jardon we do have a lesser fighter but again we have someone who is a real world level talent. The 25 year old Mexican challenger, dubbed "Crazy", is a man who lives up to his nickname. He is rarely in a dull contest and with his power he's not a man to take lightly. On Jardon's ledger we have seen him scoring victories over Gamaliel Diaz, Miguel Roman, Ricky Sismundo and Rene Gonzalez. Sure he has lost some along the way, including a very early career loss and a split decision to Miguel Roman, both of which have since been avenged, though he has also been stopped, in a massive upset, by Kyohei Tamakoshi. The loss to Tamakoshi is perhaps the lingering issue for some about Jardon. That loss, which seemed to be partially from over-confidence, saw Jardon losing for the first time in well over 5 years and also saw him ending an 18 fight winning streak. Take out the fact that it was a "bad night at the office" in terms of the result and Jardon has since proven his worth and it's fair to say that he is world class. What makes this fight exciting is not only the fact we have 2 top 10 guys in the ring together but stylistically they match up perfectly. Both are free swinging, both are heavy handed and both can be knocked down. It's not quite a case of who lands first wins but neither will want to take more than a few shots at a time and any exchange could be the final exchange. In regards to brawling both men have the power to stop the other. Of that we have no doubt. When it comes to boxing though Miura's slightly more polished boxing skills should see him being able to win rounds and control the fight a little bit more. Jardon's boxing is quite limited, powerful but limited. It's this difference in boxing skills that make us favour Miura by late stoppage. The fight is guaranteed to have fireworks, it's guaranteed to be explosive and it could well be a very late runner for the best fight of 2013. Do not miss it, or in fact miss the televised card on Tokyo TV which also features the all-Japanese battle between Takashi Uchiyama and Daiki Kaneko. Hopefully 2014 will see the winners colliding, Miura v Uchiyama II anyone?